1" Flange x 3/4" Hose Barb Fitting | U.S. Plastic Corp. Manifold Flanged Fittings are used in various agriculture and industrial liquid flow applications. These quick - change connections allow you to replace or inspect fittings in seconds as opposed to time consuming threaded liquid handling systems. Easy to use, there is no pipe thread installation, no chance of cross threading, no pipe sealant and no cure time needed. Versatile by nature of the connection - it is easier to redesign, alleviate space constraints and add pieces to your liquid handling system. 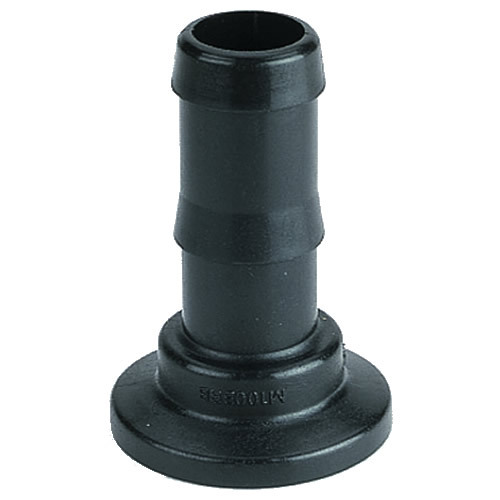 These sweeps are a direct replacement for standard 90° flanged couplings. They offer positive seals and are quick and easy to assemble. They provide an easy on/off hose connection and 360° orientation. Manifold Sweeps are available in glass injected polypropylene material. 1" and 2" fittings are rated for pressure to 150 psi at 70°F and 3" fittings are rated for pressure to 125 psi at 70°F.